Send your insect questions to Ask Professor Phasmid and check back on Wednesday to see if it has been answered. Your question may have been asked already so please remember to scroll down the previous questions and read the answers to a wide range of insect questions. There is no limit on the number of questions you can ask. Don't be disappointed if your question isn't picked, try again and you may be lucky the next week! 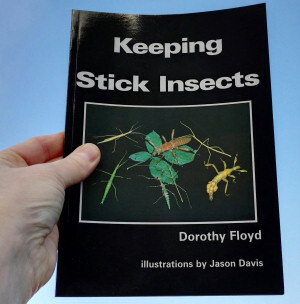 Written in a clear, easy to read style, this book is a popular choice because it is a really helpful guide on how to look after stick insects properly. You can also learn about how stick insects live; for example how they breathe, grow and reproduce. The information is presented in a clear way and so is easy to understand. 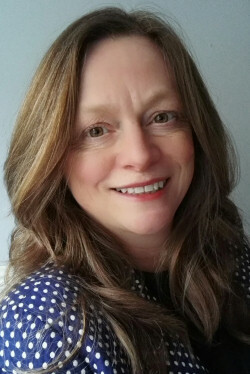 The author, Dorothy Floyd, studied at Cambridge University and uses her scientific knowledge gained from that time, together with her extensive personal experience, to produce a book that is packed with valuable tips, fascinating observations, and accurate biological information. This book has colour photographs, including close-ups of eggs of popular stick insect species, and detailed illustrations. Seven species of stick insects are discussed in detail and there is a school topic ideas section at the end. 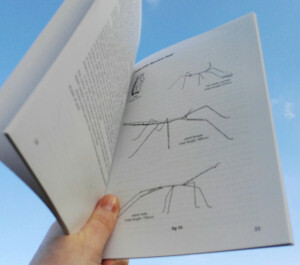 Keeping Stick Insects has 64 pages and contents and index pages. It has a spine and laminated cover and is printed in the UK. The ISBN is 0 9512466 0 7. This book is still in print and has already been reprinted several times. The author, Dorothy Floyd, is happy to sign her book for you, this is a free service. Just request this when you order and include any message that you'd like her to write. Price: £12.50 + £1.95 first class post to anywhere in the UK. Each Collector Card features a photo and useful facts about a particular species of stick insect. The Collector Cards are laminated to make them durable and so are ideal for display. 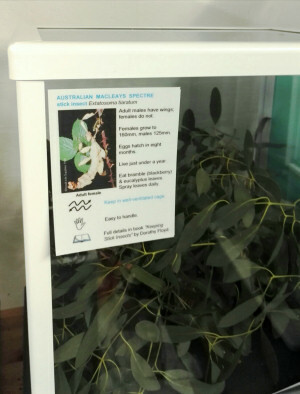 You can match the Collector Card to the actual stick insects in your cage and stick it on the front. There are 19 Collector Cards altogether. Each Collector Card is 90p. #1 Australian Macleays Spectre, #2 Thailand Marbled, #3 Guadeloupe, #4 Peruvian , # 5 Sabah, #6 Borneo, #7 Indian, #8 Thailand, #9 New Guinea, #10 Pink Winged, #11 Vietnamese, #12 Thailand Winged, # 13 Thailand Straight, # 17 Vietnamese Bark, # 18 Thailand Miniature, # 19 Malaysian. #14 African fruit beetle, #15 Giant Congo millipede, # 16 Giant African Land Snail. If ordering with other items, total delivery is capped at £9.95. If you just want the Collector Cards, delivery for 1-18 Collector Cards is £3.95. 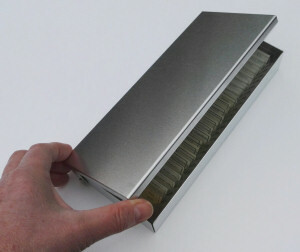 Small-Life Supplies produce these stylish slide boxes which hold up to twenty-four microscope slides. 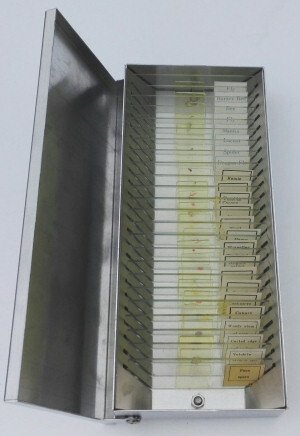 There is a hinged lid which opens out fully so you can easily see the slides and pick out the one you need to examine under the microscope. Made in the UK from aluminium and designed for the standard microscope glass slide size 25mm x 76mm. 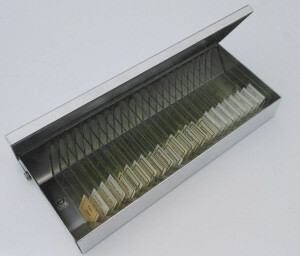 The overall dimensions of the Aluminium Box for Microscope Slides is 210mm x 90mm x 35mm and the approx weight (without slides) is 200g, and when full of slides is 335g. Please note no slides are included. Delivery Everything is in stock and shall be dispatched quickly. Books are dispatched by first class post, other items by trackable courier. The delivery price is capped at £9.95. VAT Prices include 20% VAT unless otherwise stated. The book is zero-rated. A receipted VAT invoice shall be sent to educational establishments and companies. The Small-Life Supplies VAT number is GB 473 5005 60. Small-Life Supplies, Bassenhally Road, Whittlesey, Peterborough. PE7 1RR. UK.